Photo: Nigerian man arrested in India for illegal stay - SWANKYLOADED OFFICIAL BLOG. Police Inspector Jivba Dalvi informed that he, along with staff, were on Motor vehicle checking in the jurisdiction when they noticed a foreign national riding a scooter. The team of police asked the man to stop, but he tried to flee from the spot. However, the police chased and arrested him. During investigation, Kenneth was not able to produce passport, visa or any travel document, following which he was booked under section 3(2)(a) and 6(a) of Passport Entry into India Amendment Rules, section 6(a) of Passport Act, section 7(3)(iii) of Foreigners Order Act 1946 R/w Section 14 of Foreigners Act 1948. The police also detained the owner of the scooter, which the Nigerian national was riding. A case has also been registered against the scooter owner under Section 336 of the Indian Penal Code (IPC) for giving the scooter on rent to a foreign national without proper verification. He has also been charged for allowing a person without a valid license to drive the vehicle endangering human life and the personal safety of others, under Section 180 of Motor Vehicle Act. The police also registered a case against the owner of the house, where the Nigerian national was residing. 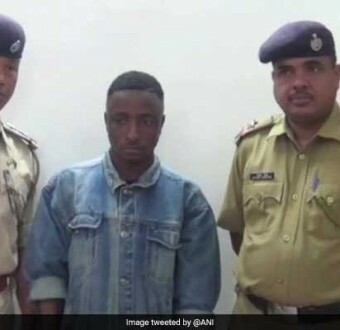 During the investigation, it was found that Kenneth was staying at the residence of Sanjiv Verlekar in Candolim, who did not submit any C- form to the Foreigners Regional Registration Office (FRRO), Panaji regarding the stay of the Nigerian national. Another case has been filed against the owner of the house under Section 14 of Foreigners Act, 1946.